Investors in short-term Treasuries and savings products are having a field day. The US Treasury yield curve is having some bad-hair days. It is overall flat-ish, but within this description, it is steepening at the short end, sagging in the middle, and steepening at the long end. And all of it, from the one-month yield on up, is above the rate of inflation as measured by CPI, something we haven’t seen in that magnitude since the brief deflation scare in 2009. December 14, 2016, when the Fed got serious about raising rates (green line). The blue line (yields on January 3) sagged heavily – a sign that the yield curve was “inverted” in the middle between the one-year yield and the seven-year yield. This inversion in the middle has lessened somewhat by now (red line), and the line is sagging less, as the longer end of the yield curve has risen. The spread between the 2-year yield and the 10-year yield, currently at 19 basis points, is very narrow, but it has been in this 18 to 25 basis point range since August 2018, and it has not yet inverted (where the two-year yield would be higher than the 10-year yield). The black horizontal line in the chart above denotes the annual rate of inflation in December, as measured by CPI (2.2%). 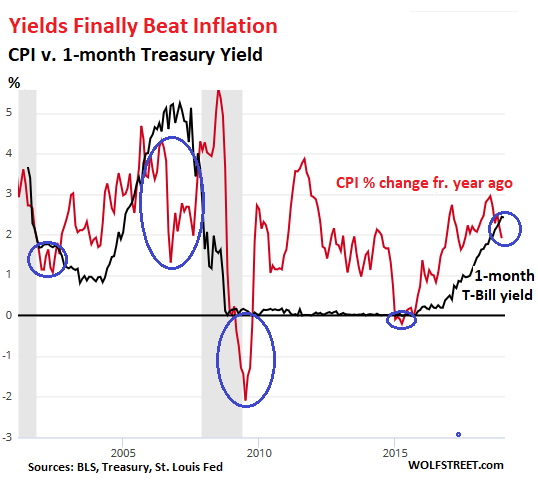 With the one-month yield at 2.41%, it is 21 basis points higher than CPI, something we have not seen since the deflation scare in 2009. The chart below shows the one-month yield (black line) and the annual rate of inflation as measured by CPI (red line) going back to 2000. There were only five periods over those 18 years when the one-month Treasury yield was above the rate of inflation. For the rest of the time, the “real” yield was negative, a situation when investors don’t even earn enough of a return to make up for the loss of purchasing power brought to you by inflation. The Fed can manipulate short-term yields with reasonable consistency. So when it pushes them down below the rate of inflation, it’s not an accident. It’s punishment for everyone that has money invested in short-term low-risk instruments, from T-bills to savings products. And as the chart above shows, this form of punishment has been the “normal” condition over the past two decades. There have only been five fairly brief exceptions. One of those exceptions was in 2016 during the oil bust, when energy prices plunged. During that period, CPI growth dipped into the negative (deflation), but only very briefly, and only a tiny bit, just enough to put it below the one-month yield which was near zero due to the Fed’s zero-interest-rate policy. The current positive “real” one-month yield of 21 basis points is more significant. And this is one reason why the Fed might want to be “patient” with raising short-term rates further if it wants to keep monetary policy near “neutral.” If short-term yields end up significantly above the rate of inflation, it has a tightening effect on financial conditions. But for investors in low-risk assets, such as short-term Treasuries, money markets, and savings products, this is one of the few periods in two decades when inflation doesn’t eat their lunch. Should we not look at returns post-tax? Will post-tax returns be lower than CPI? Everyone’s tax rate is different. So no one looks at stock-market gains/losses, dividend yields, or whatever after some theoretical tax rate. All investment returns are figured pre-tax. Apples to apples. That argument won’t work with the IRS. You can look at this the other way. Take the 1-month rate. 2.41% rate vs. 2.2% CPI means a 9.5% premium over CPI. If your marginal tax rate on short term lending is higher that 9.5%, it’s not worth it. 9.5% is low enough that for most cases there is still not actual protection against inflation. I think it’s too early to say the FED is done with increases in rate. The consensus word I hear from the Fed is “patient.” That doesn’t meat they’re “done with rate increases.” Not at all. They’re going to let this shake out over the first half. And if things stay were they are right now, they’ll likely nudge up the rate again later this year, once, perhaps twice. The bond market is now projecting CPI at 1.7% for the year so your premium backs into it with no change whatsoever. Even at the lowest tax rate, savers are still being punished. Taxes may hurt them as much as inflation, depending on what other assets they possess &/or purchase. Correct. The whole system is meant to incentivize speculation over investment. Hence qualified dividends and capital gains get taxed at a lower rate than interest and wages. Does this affect borrow-short, lend-long business models? Or is it a temporary situation that won’t affect them? It was no surprise that high yield or loan products got the attention they did. So did high dividend yield ETFs. We needed a substitute to Treasuries then. But since 2018, there was an alternative since Treasury Yields became attractive again. The real scare for savers is figuring out how long this normal is going to last. We need about 2-3 year visibility. Planning where you are getting unearned income such as interest is vital for retirees. For investors they see it as just yield. For us retirees, it is money to spend each day. Hence the yield in 1Y and 2Y is very critical. Reinvesting 4-week is not enough for planning the near future. So long as QT continues, there will be upward pressure on rates as liquidity is drained from the system. It appears as if this is setting up to be a perfect storm. Don’t forget the unrelenting appetite of the Federal Government for money at Treasure auctions sucking up liquidity as well. From the CBO monthly budget review for December. If there is a slowdown that number will go through the roof. Seems to me we need a serious talk with Mr. Inflation Numbers. Each time I pay for groceries, meds, insurance, my son’s tuition, and transportation; I shake my head because it’s much higher than the published numbers. J. Gundlach says his breakfast now costs 6.5% more. So even if I practice Mark Cuban’s suggestion to buy everything I need on sale (discount), the big expenses never go on sale. VYM yields only 3.4% now, so to get ahead of real inflation means taking on more risk. I agree. Mr. Inflation Numbers is a laugh riot joke. Fake News. Propaganda. Get real, Mr. Inflation Numnbers. There are lot of things that have gotten a lot cheaper too. This includes electronics from laptops to TVs. People take those for granted and just cite the breakfast at a restaurant where prices were raised for the first time in five years. Unlike food, I don’t eat a TV or a laptop everyday. Luxuries are getting cheaper while necessities are getting more expensive. Also, I would say that laptops haven’t actually gotten cheaper. The price per unit performance has gotten lower. My cost for communications (two cell phone lines and wireless internet service in a deep rural are) has declined from ca $200/month two years ago, to $100 now. Yet if you compared your communication costs to 20 years ago when you just had a land line phone your costs have soared several hundred percent. Yes, there’s an hedonic adjustment to be made for the convenience and versatility received, but we’re still paying a much larger portion of our average income today than yesterday. And compared to the increase in food, vehicles, utilities, medical insurance, and housing many Americans have experienced in the past decade your $100 savings becomes just a fart in the wind. Tomaso is right. The “real” inflation rate makes the current treasury yields a guaranteed investment loss. Using government inflation rates misstates the true investment return. Were do you eat? Restaurants have been rising prices at least once a year due to inflation and yes I meant in the USA. Not to mention that in some places like New York restaurants are money sinks. One of the greatest assets of any individual is the ability to cook your own meals. Been doing that since early teens. Now retired, a late yeared octogenarian I still enjoy cooking; it also keeps me moving around my mountain home. All local restaurants in my location have raised prices over the 20 years I’ve lived here. I’m not a restaurant goer. Never have been except when we were married many decades ago. Learn to cook! Cash in the bank! i live in nyc in a restaurant district, we haven’t gone out on a regular basis in years. just birthdays, etc. it’s just not worth the money. period. these places are paying $50k – $80k for a decent location. the end result is a pasta dinner for two with an appetizer, one glass of wine and a shared desert is $150. no thanks. Haven’t eaten out in a long time, probably because I like to roughly know what I’m eating :-s . My worst experience was at a posh hotel in relatively important company and I serve myself what looks like dumplings… take a bite and my face must have spoken because the person sitting in front of me looks me in the eye and says “sheep brains”. I just bought another rather unneeded machine tool. The price is discounted well and the control is very good. All of the optional stuff on the control that would jack it by another six thousand or more were tossed in. I know that machine tool sales are getting a lot harder, but in order to avoid getting gutted by tax I have to buy. I work for Lowes and have seen a steel/aluminum chimney pipe go from $299, to $450 to $650 literally in a month. Tariffs at work? Will it come back down once us production catches up? Those increases are unjustifiable for cost of materials. There is something else going on there. Health care insurance inflation has been 3X CPI or more for some time and that is one of the largest expenses in a household budget …and is often the largest. It is absolutely impossible to price compare a procedure or actually know your out of pocket cost until after you have consumed …the biggest mucking fess imaginable. Tuition inflation also bites hard for those affected, i.e. parent &/or students who don’t intend to stiff taxpayers. Other expenses pale in comparison. Cut you cable TV cord and use the proceeds to fund less than 1 years worth of inflation in either of these 2 areas alone. my aca exchange bronze policy is 25% more for 2019. That hidden price structure by the medical rackets is bald face illegal. Make a point to go visit your state’s attorney to demand prosecution. I work in biotech and our insurance is through some large biotech trust or pool. Last year they sent a statement with how much money they took in versus how much they spent, they spent less! We’re a fairly healthy pool. But this year my premiums have gone up $80/month for 2 people. What could have changed from last year to this year to cause such a dramatic rise? We have Anthem Blue Cross through the pool. Does the broadet Anthem marked affect my pool? I thought that our premiums and copays were all based only on our specific pools. Googling this kind of info has yielded nothing for me. Thought I’d ask the wisdom of the Wolf Street crowd. We then switched to Keiser … what a difference, in every respect. Our premiums have barely budged since we joined. No one should get insurance from Anthem. Ever! Period! Blue Cross Blue Shield used to be non-profits and great low-cost insurance companies — decades ago. I used to be with them. Then they became for-profits. Then Anthem bought them…. Wolf, yes I’m starting to agree with you about Anthem. I wish I had another option, but it’s all that’s offered at my work. It’s either that or the ACA marketplace and it’s cheaper for me to go through work, and our co-pays are only $10. I had Kaiser HMO years ago and they were great. I wish my work offered an affordable alternative like Kaiser even if other employees would rather have insurance like Anthem which has more doctor options. For me, everything I really need is offered at Kaiser. At this point Anthem is better than no insurance. The article and numbers are interesting. ahhh, manipulation. However, despite being officially screwed, savers and cash investors still have one benefit. It’s better to have access to cash than hope everything paper continues to rise in value. It’s hard to put a value on being liquid, but I do know it isn’t negative or as low as comparisons indicate. Inflation is much higher than the published rates. Just got my Cable bill from my fascist Cable TV company. Went up 30% without warning and without any improved service. Actually the service has gone downhill over the past year with numerous outages, unreported. Had to call my drain clogging removal company and their price jumped 40% form the last time I used them 3 years ago. CPI figures also don’t take into account the poor customer service due to hiring lower and lower skilled workers, or the substitution of lower quality products, and smaller portions. Government economic figures are another form of fake news. I stopped cable TV a decade ago. Only get broadband – same price for the entire decade. Our wireless service costs haven’t changed in years, except we now do a lot more with it (data). Our housing costs haven’t changed much in a decade. Our insurance premiums have been about flat for three years (just got the new ones, same as last year). We haven’t bought a new car in a decade, so there is no change. Our auto insurance gets cheaper every year…. Average gasoline price in the US was over $4 a decade ago. Now it’s $2.25. You see, anecdotal inflation stuff — “they raised the price of breakfast by 6.5%” — really depends on the person. Note that housing costs rise very little for people who own their own homes (home-ownership rate is over 60%), or for people who live in rent-controlled apartments, etc. Rents are coming down in some big markets, such as Chicago. But wait, the price of eggs went up 12%…. Trying to extrapolate from the price increase of the eggs you buy to what our costs of living are is nonsense. But I’m guessing that you’re looking at this from the position of someone in either the top or second 20% family income strata. Things look a lot different lower down and for younger generations. You bought your home well before the spectacular rise in S.F. home prices; your auto insurance is dropping because drivers your age drive less (plus you’re driving your car well past its’ normal expiry date); and then there’s medicare coming up for you right? Anyone entering the job market or starting a family doesn’t have these advantages. Mortgage costs are also rising while wages have been stagnant for an entire generation. Home ownership over 60% in the States? We’ll see what happens to the housing market in the next couple of years. I’m thinking bad things are coming. At the core of my disagreement, of course, is my belief that the government is deliberately understating inflation to further its own ends. So I believe that ShadowStats’ much higher inflation numbers (as calculated by the same methodology used back in 1990) to be a much more accurate measure of inflation for the WHOLE population, especially the lower income segments who are most affected by inflation. Agree. Wolf talking his book from a 1%er like view. Not real for most people. Healthcare alone eating up more than my wage increases for the past 5 years. Wolf may not have a young family or be into Medicare now for all I know. 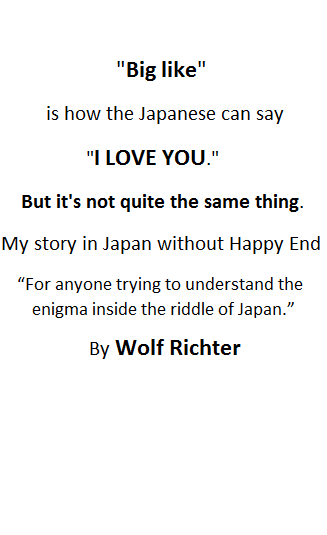 wolf, for the purposes of the article, you need fo use cpi but it isn’t a realistic number even by your anecdotes. you cancelled cable but did it’s price stay the same? yes you may have hulu now but that isn’t an equivalent service. also, you didn’t mention your real estate taxes. did they stay the same? do you have any children going to college? Where in USA rental cost is comming down? Los Angeles? NY? Essential expenses ate food shelter and clothing , all gone up inlast 10 years. How about the automobile prices, medical an health insurance cost, higher efucation tuitions, etc? Any answere? For those that didn’t buy a long time ago when prices were sane, rents and home purchase prices are very high. Totally out of line with cost of good sold or true value of materials. They are coming down a little, but I would be willing to bet that the housing costs are hurting consumerism in some industries. The real increases in COL have been in insurances, utilities, and taxes. The things you must pay. When the 3 mo vs 10 yr spread is < 50bps it tends to invert soon afterwards. We are past that now. When it inverts, recessions occur in ~1 year. Of course, this is history so we are walking on Mars with QE (and its unwinding). On average, the FED lowers rates within 6 months of their final rate hike. In other words, their soft landing is always the same …hit ground hard and then pull up. If our job performance was similar, we would all be fired. Of course, their insider passengers parachute out beforehand so they have little reason not to continue to cheer the spectacle of it all. Wolf, looking at the very small inversion in the middle of the yield curve could be influenced by the volume of treasuries being rolled over and the volume of new issuances. One would think that an increase in new issuance would affect the rate. As you had stated in earlier articles the treasury can influence this by increasing or decreasing the volume of newly issued treasuries- not to be confused with rolling over existing debt i.e. 2-3 year treasuries which would be predictable. Most American’s know very little about the dynamics of inflation and how our government creates inflation. If they did, they would laugh at the prospect that the Fed can “manage” inflation to 2%/year, +/-. Until wages for the broadest of citizens start to rise signficantly, most of the inflation we’re seeing translates to a stagflation economy. That is, as prices for essentials go up (food for example), most people have to reduce purchases elsewhere. This has been one of the driving factors of the retail collapse in the US; although I’ve not seen anyone speak of it much. In the news is the House of Rep. proposing a national $15/hour minimum wage. Should that pass, people will feel better for awhile about their financial situation, but prices will rise along with those wage gains and we’ll be back to where we are now. The losers again, anyone on fixed income, anyone with no wage gains. And by the way, anyone thinking that our government (including the Fed) doesn’t want as much inflation as they can get (I’m talking 10-15%/year), needs to understand that inflation is the only way out of the tremendous debt that has been built-up over the past decades. I agree with most of what you wrote, but the notion that the Fed wants 10% + inflation… I think that’s very wrong. When we were facing accelerating inflation in ’74, then higher in ’80-82, the Fed, in effect, shut down the economy. Yes, debtors do well with inflation (paying off debt with cheaper money) but creditors take it in he shorts. And since banks are the creditors, the Fed will stop inflation in its tracks (if they can…). Thanks for your comments. The 1980 (early part) were the last years of any semblance of a normally operating economy. When Nixon took us off the gold peg in early 1970’s, that set the stage for a pure fiat system. It took awhile for folks in power to figure out what that meant and what could be done in that new setting. The Fed takes care of the banks even with high inflation. The Fed may not want 15% inflation and perhaps 10% is a bit high, but 7 or 8 % would be just fine with them. Probably what we are seeing now. The CPI is exactly what the Bureau of Labor Statistics wants it to be. The CPI is a statistical estimate derived from a continually changing market basket of consumer goods, of which energy and food is NOT included. Weighted averages are then applied to these estimations. Some monthly others yearly, changing in January of the next even-numbered year. The utterances of the BLS in recent years, have increasingly come under a cloud of suspicion as to their accuracy. So much so, that now most take their reports with a large grain of salt! The economic reality in the country when it comes to the rate of inflation, lies somewhere between the BLS number (on the low side) to John Williams Shadow Stats number on the high side. Plain Main street common sense, tells the average citizen that the cost of living is going ever higher at a quickening pace. Certainly quicker than wages. The yield curves hold little attention amongst the paroles who are struggling to make it day-to-day, let alone putting anything aside in savings. OutLookingIn, That is a very good reason to let the goomint “shutdown” continue. The longer it goes the more that non-goomint taxcows will realise that we do not need them and their phony statistics. What I’m seeing at the grocery store are that prices are really good. Recently bought milk at $2 a gallon, $1.50 for TWO bone in chicken breasts, beef tips at $3 a pound. Over the last few months, I’ve been able to feed the two of us for about $75 a week and we’ve eaten well. Food is cheap for me now. So is gas. Filled up at 1.80ish a gallon last week. Even clothing. Shopped at the outlet store and bought a 10+ nice work items for under $200 total. I like to buy after Christmas for the deals. But everything else seems to be outrageously priced — housing, autos, tuition, insurance. I don’t understand the disconnect. Assets and services are priced high, consumer goods seem low to me. Oh, and for you restaurant goers… my husband is in this business. His food costs are low. What’s driving your restaurant bill up is the cost of labor, rent etc. but it’s not the food. The cable TV was one of the few luxuries that I could enjoy. Now that the football season is almost over there is no reason to keep paying for all of these channels that I don’t watch and subscribing to a company that is so unethical and bordering on criminal in their billing practices. I would cut it off tomorrow if my spouse would let me. On the news today millenials are complaining about a $2/mo increase in Netflix fee, while I just got hit with a $60/mo increase. Inflation is way over the CPI reported rate. I keep accurate records of my expenditures for necessities every month on an Excel spreadsheet. I would estimate that the real rate is now about 7% or higher for myself and most families. This has been going on since the financial crisis in 2008. Retirees have seen their annuity payment and savings (at zero interest rates) eroded by about 30%. This is all by design, because the government has to do this to pay its bills without raising taxes. Get an antenna. There’s enough free crap in the airwaves to keep people transfixed. Inflation at 2.2%? Then why did Treasury authorize a 2.8% COLA for Social Security recipients in 2019? Out of the goodness of Mnuchin’s heart? As for rent, we’re in a rent-stabilized building. Goes up 3% every year but when was the last time CPI printed a number above 3? Restaurants? Forget it. Even fast food places have more than doubled prices in just three years. Health insurance? We had to drop it as soon as the ACA arrived. Monthly premium up more than 100% the first year and deductible doubled with it so we couldn’t afford it no matter what the premium was. We just don’t go to doctors. Cable TV also got the axe some years ago. Price increases every year with no appreciable increase in service (quite the opposite in fact). This observer has never put much stock in yield curve movements. Even less so once the Fed started its money laundering shenanigans. Price discovery still locked up. Now we must adjust the markets to meet the unrealistic promises of unidentified politicians playing up to the public unions? Powell has done the right thing. The financial history of this country is that Fed Funds equal or exceed inflation….too bad the chart doesn’t go back to 1970….but this one does…. They’ll likely increase pension contributions in response to a shortfall. The powers that be understand that inflation is a problem regardless of what they say and report and that is why interest rates are going up. They find themselves now between a rock and a hard place due to the reckoning of the moral hazard of QE. Recession is baked into the cake no matter what they do at this point. What I am wondering is now that China has injected a trillion into their QE, how much of that will find its way into assets here? Another way to look at this is the Effective Fed Funds Rate (EFFR) overtook the Fed’s 10-year Breakeven Inflation Rate during the September 2018 rate hike. The December one just widened it. Meanwhile, the unemployment rate went below 4%. Since the 4-week T Bill yield mimics the EFFR, then yes it’s higher than inflation rate. So now that we are expecting an inflation rate of about 1.8%, then the near future would be about jobs. If the jobs report comes in hot, then expect the Fed to increase. My property taxes have never gone down, it’s my single largest expense including energy. I vote for “CPI is useless”. I’m an expert on nothing much, true, but it seems that “boots on the ground” inflation is being diluted by stuff that wasn’t an expense at all a generation ago. Cellphones, internet service, etc. Yes, my new budget model phone is a wonder but so what. Looking at jobs comparable to what I had in the 90’s, pay hasn’t changed. Healthcare has not improved (judging by 3 years of declining longevity) but prices are not only ludicrous per procedure (judging by international costs) but now we’re forced into a prepaid, more-than-you-can-eat plan, with all that lost opportunity cost to boot. I take Wolf’s points to heart, but Re: cheaper gas, that is completely subsidized by our military, by environmental abuse and related public health issues (fracking, air quality, global warming) that, if taken into account make it not so cheap. Just a few thoughts. Another thought: our infrastructure is, by our government’s own admission, neglected, if not crumbling, so aside from cheap gas we seem to be getting less for our money. Is that not inflation? We don’t even get a running government for our money anymore, but convincing people we should get something besides bickering for our taxes night be a hard sell. SUBSTITUTION: According to CPI, farm-raised, toxin-laden, genetically engineered salmon is identical to the wild salmon of our parents. And since it’s cheaper…? Deflation MAGIC! And if the price of salmon goes up too fast? Well then pollock is magically equivelant! Nutrition facts be damned! Same for pesticide-laden veggies vs the organics our parents and grandparents got for no added charge. WEIGHTING: If prices rise too much, that item’s weighting in the CPI is lowered to keep it from making the CPI look bad. Think housing, education, healthcare… only the most expensive things. 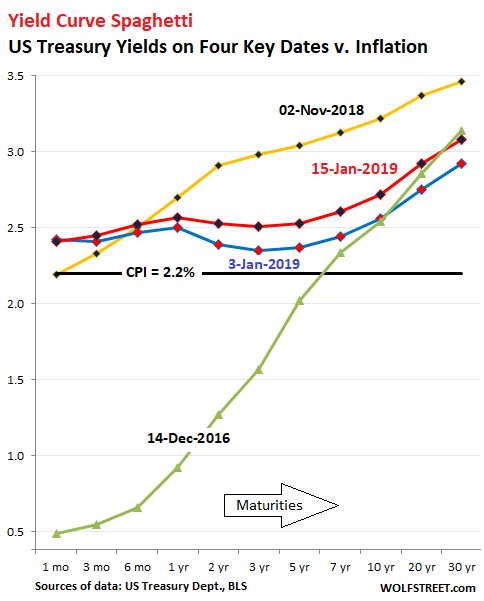 HEDONICS: If an item is “improved” from one year to the next, the “value” of that whiz-bang (as calculated by Uncle Sam) is subtracted from the current price, lowering CPI. Whether it’s a useful addition or just more crap to break and/or whiz-bang, like heated steering wheels.